Buzz Kill Ramblings of Tim Louie: WHAT BAGGAGE FEE? My wife and I, we travel a lot. More so my wife, since she travels for work, but when we travel, we like to pack light. We'll travel with one carry-on and a backpack, which never incurs any extra charges since most airlines allow that as a minimum per person. Well, this is my new hero because he attempted something that I've only seen Joey Tribbiani accomplish on an episode of Friends! 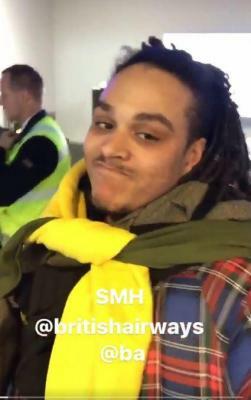 So, this British man was prevented from boarding a British Airways flight from Iceland to London after he attempted to wear 10 layers of clothes to avoid paying a baggage fee. Yes, 10 layers of clothing! I'm sweating just thinking about it. This is Ryan Carney Williams. He goes by the name Ryan Hawaii on social media. Ryan put on every article of clothing that was in his luggage while at the airport in Reykjavik last week after he was told he'd have to pay $125 to check his bag. Williams said on Twitter that he didn't have the funds to pay for his bag. So, we did what any intelligent poor person would do! He tried to beat the system and eliminate the bag and put on all of his clothes. Brilliant! Ryan Tweeted, "I couldn't afford the fee as a result of being left homeless in Iceland for over a week." In a video he posted online, Williams said that the airline employee told him he'd be able to get on the flight if he put on all of his clothes, which he did. Williams said in the video, "They're really having me dress like this to go on, and they won't even let me go on." It turned out, bundling up didn't get him on the flight either. The next day, Ryan tried to board a flight on easy Jet, which normally charges fees for carry-on and checked bags, and they didn't make an exception for Ryan, even when when he again tried to wear all of his clothes. An easyJet spokesperson said in an email, "The Captain and the ground crew were concerned about reports from the previous day, so we provided a refund and he traveled with another airline." Okay, so what did we learn here today? We learned to always have money on us when traveling, so we can pay our baggage fees. And we cannot wear 10 layers of clothing on an airplane. They get really mad! I have to commend Ryan for even attempting this to beat the system! Bravo!